Hello, all! Hope you all don't mind too much but, things are going to be pretty quiet around here. I'm going on vacation! It's been a while since my family and I have had a real vacation so, this should be very nice. 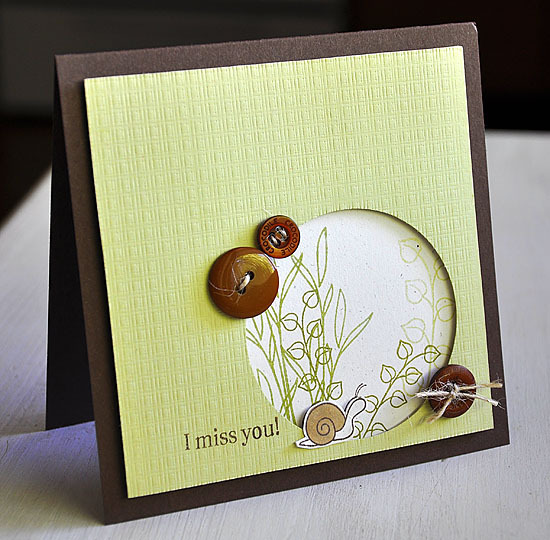 Now, how about a Papertrey Ink card... Punched a circle from Spring Moss cardstock and impressed it with Linen & Canvas Impression Plate. Then stamped a sentiment from Flutterby Friend. Stamped a bit of foliage (in Ripe Avocado, Simply Chartreuse & Spring Moss) behind the circle using stems from Flutterby Friend. 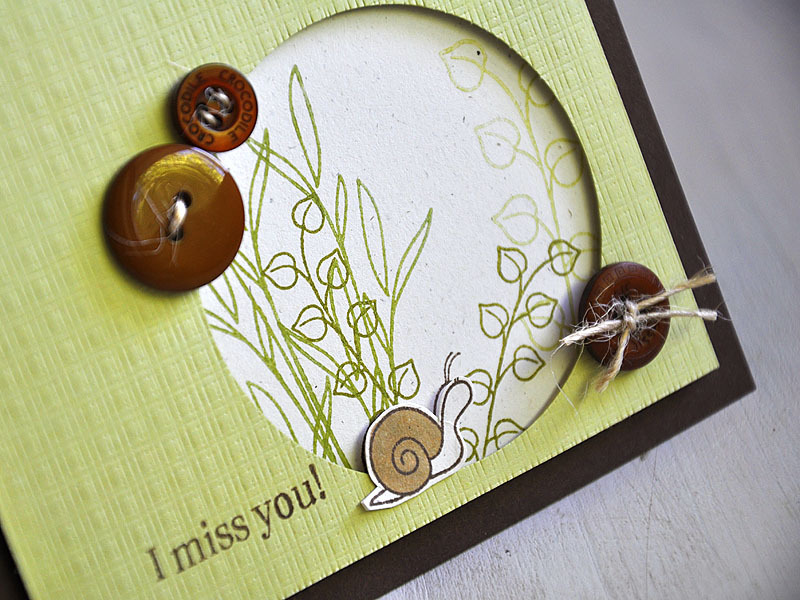 Then finished it off with a few Dark Chocolate buttons, rustic button twine and a cute little snail also from Flutterby Friend. We'll miss you :) Have fun! What a gorgeous card you made. I ordered some Paper Trey stuff aswell and had it here yesterday. I have to play with it next week!! On my blog I just placed a special for a wedding. What a nice card - your blog is sooo inspiring! Will miss you - enjoy your vaccation! Love this card Maile! It has a very tranquil color scheme. Enjoy your vaca! As always, you make simplicity with such a WOW factor. Absolutely beautiful! I love this card. It is so fun and so detailed but yet so simple. Great job!!! Have a great vacation. Vacations are always needed. this is awesome...can't wait to try this...have a wonderful time on your vacation! Wow! Love the card; awesome design. Have a great vacation. Such a simple looking card but so striking at the same time!!! Love it! Beautiful card! I've always admired your work. I thought I'd come out hiding and tell you how much you have inspired me. Love it - as always you rock my socks off girly! Miss seeing your work everyday, but hope you are having a fabulous vacation! You deserve it. :) Be safe and see you soon. Beautiful and very elegant...enjoy your vacation! Hope it is wonderful! Wow..what a beautiful card! I love the little details on it. Fabulous!